How do you go about flavoring kombucha? I add fruit/juice/other flavoring after the initial brewing, when the scoby is removed and the kombucha liquid is placed into bottles or jars. You can also brew with flavored teas, although those that contain essential oils (such as Earl Grey) should be avoided. Many essential oils have anti-bacterial properties that can damage your scoby. After bottling, let the jars/bottles sit on the counter for a day or two and then I refrigerate it. Time on the counter increases the carbonation. If it is warm/hot the fermentation will proceed rapidly, and carbonation will build up quickly. In winter, I might leave it out for two days, in high summer, one day or less. Refrigeration slows the fermentation process and makes your bottles less likely to fire off like a rocket when opened. When I first began brewing, I did a lot of hunting around on the internet looking for information on how to flavor kombucha. I didn't have much luck. It seemed like the people who were doing it just did it, and it was a given that you should know how to do it. To that end, I'll share my kombucha flavoring ideas. One of the things that I like best about kombucha is that you can stick fruit in the jar for flavor and forget it, unlike kefir soda where the fruit needs to be strained out. I don't measure my fruit, I just keep stuffing pieces in until the bottom of the jar is covered, plus a bit more. tart cherries – I tried these plain, with almond extract, with vanilla extract, and with both almond and vanilla extract. Thus far, 1/2 teaspoon almond extract is my favorite, but I still prefer the blueberries, raspberries and strawberries. Neither the peaches nor the pears were very good. They just didn't have a very strong flavor. The peaches were a little better than the pears. I've also used fruit juice, between 1/4 and 1/2 cup per bottle. I actually prefer just the plain fruit myself, but some people don't like the fruit chunk floaties in their drink. Tang instant drink mix, 1 tablespoon per jar – ACK! This was terrible – much too strong! Cinnamon stick, two cloves, 1/8 teaspoon cardamom – spicy, but good. Tasted like mulled cider. Ginger, fresh, enough to cover the bottom of the jar – This was pretty good. I'm still working on finding right amount to have enough ginger but not too much. UPDATE on the PINA COLADA flavor – my current favorite combo to get a pina colada flavor is: 1/4 cup coconut water, 1/4 teaspoon coconut extract and 1/4 cup pineapple juice or 1/4 cup fresh diced pineapple. This knocks the pants off the dried fruit version. I've been using less coconut water, since I found out that some companies are harvesting the green coconuts for their water, which is negatively impacting the coconut oil supply. (Not sure which companies use mature coconuts – need to make time to research this.) Fresh coconut water and/or coconut meat really adds and amazing extra punch of flavor. If you need a kombucha SCOBY or brewing equipment, I recommend Kombucha Kamp. When my sister was bottling her first batch, her brother-in-law stopped by for a visit and asked what she was doing. She explained and offered him a glass of her brew. He drank it down, and then asked how quickly it should have an effect. He then told her that he had had a stomach ache for the last four days, but after he finished his kombucha his stomach finally stopped hurting. My thought on this is that he may have been suffering from low stomach acid, and the kombucha, being acidic, could have very quickly helped with this. The other story is a little more graphic. Don't read on if you don't want to know about bodily functions. A friend of mine, who has been on a variety of prescription medications for years, had the urge to consume a large quantity of kombucha (around one quart, straight down the hatch). I normally wouldn't recommend this large of an amount to someone who was just starting out with kombucha, but I have read that they used similar amounts, given daily, to treat hospital patients over in Russia. After drinking the kombucha, the next time he paid a trip to the bathroom he passed a very black, almost tar-like stool. Afterward, he said his energy levels felt better than he had in some time. He started brewing kombucha. Hopefully, between this and making other dietary changes, he will continue to see improvement. I've come to enjoy this bubbly drink, and consume it regularly with meals. I haven't noticed any dramatic results personally, but I anticipate continuing to brew and drink it for years to come. Your guts tend to slow down as you age, so this is a good way to give them a little”jump start”. Consumption of probiotics also helps you ward off infection and illness. Do you have a kombucha story you'd like to share? If you have favorite flavor combos, please let me know. Happy brewing! Laurie, my kombucha does not get bubbly ~ do you have any idea why? I loved reading how you flavor yours. I would be inclined to just add fruit juice. Very creative! If you follow the two-part brew method that was listed at the top, (using a lock down bottle), add something sugary like fruit juice, leaving only about a half-inch to and inch of air at the top of the bottle. The bottles should not be colder than room temperature, or it will take a very long time for them to bubble up. Once they start making little screeching noises from the pressure (it reminds me of tires on pavement or a baby screaming) then I put my bottles right to the fridge to stop the fermentation process. I give it at least a few hours. Be prepared for an eruption (think a shaken bottle of champagne when it is opened). I have learned to open it very very slowly, letting the pressure escape a little at a time, and I keep a large bowl under the bottle so that I don’t lose any. Good luck! You can do this. We bought some in the store to try out before attempting to brew our own; it wasn't terrible but neither I nor my wife were able to overcome the vinegar after-taste. I’ve recently started drinking kombucha and the store-bought stuff is much stronger than homemade that friends gave me. So i decided to make my own. I just bottled my first batch today. So don’t give up on it! Try some that is homemade. We were traveling this past week and I bought some commercial kombucha. It had an aftertaste of stale flower water – even though the flavor was supposed to be cranberry. Homemade is soooooo much better. I've been making kombucha coming on 2years straight now. Brought my first scoby's / starter home on the plane with me from Alaska. My daughter flavors her kombucha with berries they pick wild up in AK. I've stuck to ginger root as an extra digestive aide for my husband. Started out making two 3 quarts a week, then upped to Five. Currently making Eight jars. Was thinking I would back off but summer is coming up. My husband drinks with ever meal and in between. Surprisingly, I have found them at Aldi’s…. containing some sort of fancy juice like ‘pumpkin cider’ or ‘french lemon-aid’. They clean up nicely and not overly pricey, plus you get the great seasonal flavors! Interesting to read about kombucha, I have actually never made it myself but many of my friends make it. I've heard so much about kombucha, but still haven't made it for myself. Thanks for sharing all this great info! Michelle – what type of bottles do you store it in? Unless it has a tight seal, it won't get very bubbley. I have stored some in Mason jars and it is much less carbonated. Also, once it is bottled in a tightly sealed jar, I keep it somewhere warm for at least a day. do avoid leaving it somewhere warm in a tightly sealed container for too long, as it can build up a lot of pressure and launch like a fountain out of the top of the jar. My brother found this out when he opened a jar that had been sitting on the counter in a warm kitchen for a week. Very messy! Glenn, brewing your own gives you much more control over the flavor. I do not care for unflavored kombucha. A younger brew (fermented only 7-10 days) will have a much milder flavor. Also increasing the amount of fruit or fruit juice will also mellow out the flavor. My friend MJ did not care for the more acidic blends, but found the 1/2 cup of mango juice per bottle to be quite good and also liked a strong ginger flavor with plenty of carbonation. Marillyn, I purchased my bottles at House of Homebrew (http://www.houseofhomebrew.com/), which is right around the corner from my husband's Great Uncle's place (very handy, we visit the uncle weekly). You should be able to find something at almost any home brewing supply store, but HOH will also ship. Laurie, I am brewing it in a glass jar with a paper towel secured with a rubber band over it. I was told that the kombucha would become rancid if it did not breathe. Makes sense now why it never gets bubbly! So, it is okay to seal it tight for brewing? Or do you seal it after you brew it? When I do the first ferment (with the scoby), I have it in a large glass container covered with a towel, sealed with a rubber band. When I add flavoring, I seal it and then do a second ferment without the scoby (although when it's been warm a "mini-scoby" has sometimes grown in the bottle). I have been brewing kombucha, water kefir, and milk kefir for over 2 years. This is the first time I have tried to mix flavors with the ferments and do a second fermentation in the wire cap bottles. I have been experimenting and having the same trouble you are having finding the right ratios. Your article will save me some time. Lee, thanks for stopping by, and I'm glad you found the information helpful. One of the things I like best about flavoring kombucha is that it's very forgiving. Even though some flavors haven't been great, there haven't been any that were completely awful, either. You had me at "pina colada." I haven't tried flavoring my kombucha yet, but the pineapple and coconut sounds right up my alley! The pina colada is good! I just polished off a bottle today. The dried apricot improves with age. 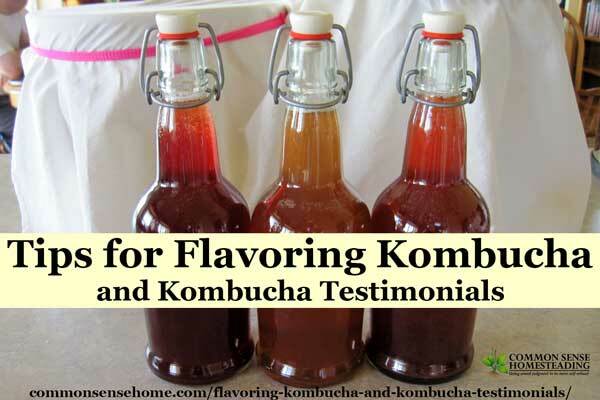 Hi Laurie, lovely post on flavoring Kombucha! Found you on food renegage. Here is a link to my website that provides an extensive Kombucha overview for anyone who has any questions. I have been brewing for years and your flavoring ideas were spot on–keep on brewin!!! Hi Oystergirl, I appreciate your site. Maybe I have missed it, but do you have anything on analysis of flavored kombucha? I have been blogging here about it recently. I am concerned about flavoring with ginger root and CPTG lemon essential oil because it doesn’t seem to keep the kombucha flavor as much as flavoring with fresh fruit. I have kept it up because it is a favorite. I am 99% sure I am not getting anything detrimental, as everyone who drinks my kombucha reports only good things, but I am just wanting to give the very best product to my customers, as I have a little café with my siblings where we sell my kombucha. I have decided to stop making this flavor until I find out more specifics. Any info would be much appreciated! Thanks! Suzanne – have you visited Kombucha Kamp? They do a LOT of experimenting with kombucha and may have some more answers. Cultures for Health may be another good place to look. I tend to experiment with variations that I know won’t have a major impact on the probiotics of the blend. I've made kombucha for a few years now. In fact, I got my first SCOBY from AnnMarie (Cheeseslave)! I do not flavor it, as I enjoy it plain. I do, however, have a KT testimony. I am double jointed and had very bad arthritis symptoms in my hands, fingers, hips and knees during my last pregnancy. I did not mention it to the dr since I wasn't going to take any meds anyway. After my babe was born, it remained. Several weeks after beginning kombucha, it was gone. Wonderfully gone! If I go more than two weeks without brewing any, it creeps back in. I make sure to keep the jars full! I also have had the pleasure of finding my gray hairs turn back to my natural color. I was plucking grays one day and found one with dark roots. Then I found another and another the same way! I still have some stubborn ones, but many fewer than I used to! I’m not aware of kombucha being used to get rid of grey hair. You could dye it with natural henna, and sometimes diet changes have been know to change hair color. I have the same joint problem (ankles only) from my last pregnancy. I got increasing gray hair, and unable to get rid of post pregnancy belly bulge. I hates drugs – eventhough my father and best friend are M.D.- and refuse to take any drugs…unless I was in severe conditions and need drugs in an emergency room. Anyway, I am up late brewing my first batch of SCOBY from bottles of GT Kombucha and High Mountain Kombucha. I made 4 different brew combinations of different type of teas, water and sugar concentrations. I hope to get different tasting KT base. I keep mine in the dark in my oven that I rarely use. Hope I have luck with my joints, gray hair and belly bulge. Can't wait to try my brew. Thank you Mommaofmany for testimony posting and Laurie for your flavor posting. if you add fresh fruit juice to the Kombucha do you have to keep the bottle refrigerated or the Kombucha will help preserve the juice? Thank you all for stopping by, and you're welcome to link anytime. It's great to read other people's stories. Silvia, because the fruit and fruit juice contains sugars, and the kombucha is acidic as well as biologically active, the fruit juice is "preserved" by the kombucha. That doesn't mean that it will still taste exactly the same. The kombucha culture will start eating the sugars in the fruit, just as it eats the sugars in the original brew. I typically leave mine on the counter (after adding the fruit or juice) for around 24 hours, to give the brew more carbonation, and then refrigerate, which slows down the fermentation. I prefer 1/2 cup or less of juice per bottle, just to mix things up a little, but friends who are new to kombucha tend to prefer fruitier blends. Be careful – too much juice or fruit and warm temps can build up a lot of carbonation very quickly! I still have some raspberries stuck to the underside of my cabinet from opening one jar a little too much. At the end of this week my FIRST gallon of Kombucha should be ready. I'm so excited!! Do you eat the fruit chunks while drinking the kombucha? I've just started flavoring mine with fresh fruits and I've been eating them.. is this a bad idea? Hi Josh. Yep, I eat the fruit. I've been known to slurp down a baby SCOBY, too (a small one that has formed in a bottle neck). I think they taste kind of like oysters. Blueberries are my favorite, as they tend to "pop" in your mouth because of the carbonation. You should be aware that adding too much fruit or juice and leaving the brew unrefrigerated for an extended period of time will likely increase the alcohol content. I personally have not noticed any kind of "buzz" from drinking kombucha, and I'm pretty much a lightweight when it comes to booze. There's been a bit of a stink in the news lately about kombucha being too alcoholic, but I haven't seen it in mine or my friends' brews. Thanks again for sharing one of your "babies" with me. 🙂 I've now given away two myself. My next one is going to stay here with me and we'll have two batches brewing at once. The Big Guy and I are really enjoying it. I'll be linking to your post from my blog. Thanks! I've been enjoying store-bought Kombucha for a few years now, but now I'm in the process of making my own. A friend gave me a scoby, and we're off! The reason I'm commenting is because I, too, like detailed instructions. I went online to learn more about how to flavor my kombucha, and that's precisely how I found your blog. I really appreciate all the detail you've shared here! Thanks *so* much. Wendy – glad it worked out for you. If you know someone else who needs a scoby and you don't have one available, let me know. Mindy – glad I could help. It's soooo much cheaper to homebrew. I've started buying my tea loose in bulk through a Frontier buying coop and that helps keep down costs even more. The taste is lovely, too. Not sure if anyone has posted about this yet (I didn't have time to read through all the comments) but lemon/ginger is AMAZING! I just put a few pieces of zest in the VitaMix with a whole lemon and a hunk of ginger then squeeze the subsequent juice through a nut milk bag and viola! I let it sit for 10 days and it is sooooo good! Have you done anything with herbs? I am thinking about trying nettle or red clover (if I can find a reasonable price). I think there would have to be a third bottling after that though? Also, have you entertained the idea of continuous brewing! I love it! I brew 7 gallons at a time but you can only bottle 20% of that. It works great if you have the counter space! Wysteria – I don't think anyone suggested lemon and ginger together. I don't have a VitaMix (thinking about it more and more :-), but I bet you could put in some zest and ginger slivers and get a similar effect. I haven't experimented with herbs yet, either, although the book Full Moon Feast has recipes with herbs and water kefir. If you bottled with the herbs and strained before drinking, you'd probably be fine without rebottling again. I've never tried continuous brewing. Does the flavor get a lot stronger as it ages? I know the composition of the brew changes over time, and certain benefits are only available from older brews. I'd have a tough time making room for seven gallons! I've tried a few new combos this summer – black cherry juice alone and with other fruit and strawberry juice that I drained from strawberries that were going into the dehydrator for fruit leather. I think black cherry and raspberries is my favorite out of the new mixes. You don’t have to use a VitaMix to do that. I use a Nutribullet. You could use a blender as well. To make ginger juice: I use 1/2 pound of ginger in 2 cups of water. In the Nutribullet and then squeeze it in any which you want. I don’t like to do it in a nut milk bag. I put the juice in a plastic mesh strainer and squeeze it with a soup ladle. Just a suggestion. I love my VitaMix! I use it every day! Can't recommend enough! I used a little zest but mostly the lemon pulp, it was amazing! Highly recommend! I'd never heard of Full Moon Feast until you mentioned it, now it's appeared on my radar one or two more times, I'm going to have to check it out! I really want to try herbs but just haven't gotten around to it. I was thinking ginseng might be pretty powerful! Or perhaps make a decoction and then put it in the kombucha with a tiny bit of sugar. I have had elderberry from a place in Vermont that was AMAZING and schasandraberry (sp?) from a brewer in CT which is also very good. The flavor does get stronger with the continuous brew. What I like about it is if you do the 20% off and add 20% fresh sweet tea you have new kombucha every 2 days once it gets going! I have been bottling more then that so there is a bit more time between. I also love drinking it straight from the tap. It's got a different flavor every day! I'm looking forward to doing apple this fall. Black cherry sounds excellent though too. And I absolutely love raspberries so I'm sure they would be awesome in Kombucha. I've got a batch of orange ginger going as well as blueberry and cranberry (from the juice). I just bottled two gallons of water kefir so I think I'm going to have to check out that book! Question- is the VitaMix a juicer, or just a high power blender? I've got a blender on my Bosch kitchen machine that's pretty powerful. I made my first green smoothies this week. I saw Full Moon Feast mentioned on FB and a number of blogs before I ordered it. It's an interesting read. I'm doing Rosemary Gladstar's course. I plan on playing soon! I leave my continuous brew going for a week or two because I take more then the 20% out of it. I like that I don't have to clean the container or mess with the SCOBY. The VitaMix is a high power blender. They got video's on their site. It can blend a avocado pit! I love it. I use it as a juicer/blender/nut butter maker/soup maker, etc. I've been doing some reading about kombucha. I am a diabetic and my son has severe stomach problems. He's been to the doctor, who can't find anything wrong. I would really like to try the tea, but it kind of scares me. We don't eat healthy at all, although we should, so would this make a difference in the way the kombucha affects us? Also, how do you store the scoby? Where would I obtain a scoby? Is the tea hard to make? What if I want to stop for a while, can the scoby be stored until I want to start again? I would appreciate any answers. You can email me at d.koga@yahoo.com THANKS in advance! If anyone is willing to sell me a starter, please email me. Wysteria – I bought a Vitamix. Very handy for green smoothies and gluten free cooking. Kombucha is not a miracle cure, it only helps the body to help itself. Eating healthier would certainly be a good thing, but I have seen those who do not eat well benefit from kombucha. You can purchase a kombucha starter from Cultures for Health: http://www.culturesforhealth.com/Kombucha-Tea-Starter-Culture.html and other online retailers. You can store a scoby indefinitely in a glass container at room temperature. Keep the scoby covered in kombucha liquid. Keep the container covered to keep bugs out. I've only discovered kombucha less than a week ago, and I love it so much I'm already brewing my own batch. The flavor I initially tried only had blue-green algae added, so I think it got something closer to what straight kombucha tastes like. Tastes a lot like brut champagne, if you ask me! Anyway, here's my question: you mention adding so much of an ingredient to a jar; what size jar? Is it the 3 quarts of the original batch, or the bottle you're bottling it in? Also, are those just Grolsch (12 oz) beer bottles? I have a bottle capper, which doesn't let the metal in the cap contact the brew, so I might go with that. Just checked my jars, and they are 16 ounces (http://www.houseofhomebrew.com/products/16-oz-clear-ez-cap-glass-beer-bottles-case-1). I make up three quarts at a time in the gallon container, and then divide it into individual bottles and put flavoring in the bottles. A little more or less juice or fruit is no biggie, although I wouldn't add too much or you are more likely to get an explosion. The nice thing about the bail top bottles is that it's easier to release a little pressure at a time, but regular beer bottles would probably work just fine as long as you don't let them sit too long. Laurie: It's G.T. 's Multi-Green, which has the algae added. I've been using Newcastle Brown Ale bottles to put it in, mainly because they're clear glass (I prefer to see it) and they're a little shorter than standard beer bottles, hence easier to put in the fridge. Bottle cappers are available at brewery supply companies for less than $20, and the caps are about $8 a hundred. As for flavoring, I've tried blueberries, strawberries, raspberries and chopped ginger mixed with a squeeze of lime. I used frozen fruit since its winter and hard to get good fresh stuff. However, on a later batch, I tried some natural essential oils (Young Living brand, which are food safe and natural) THEY TASTED AWESOME! They sell natural fruit and spice extract oils, and they seemed to do well without hurting the kombucha. FYI: Walmart sells a HEAVY DUTY glass jar that holds 2.5 gallons, for $10 bucks. It's about 1/4 inch thick glass. I'm currently using a 1.5 gallon pretzel jar (1 gallon batches), but I'm about to start making 2 gallon batches this weekend! I usually don't polish off an entire bottle in one sitting. I scoped out a capper at House of Homebrew, and they are reasonable, but now that I have a good stock of the bail-top bottles i am usually good to go. I usually use dried and frozen fruit in winter, too. I put some prunes in a bottle last batch, but I haven't sampled them yet. I was lucky enough to get some gallon glass pickle jars from a local restaurant, so I am well set on containers for now. Hi, Gary here. I'll have to figure out what my URL is so I can comment properly. For herbs I tried making a simple syrup (1/2 sugar 1/2 water)and simmered a bag of Red Zinger tea (hibiscus, orange etc) in it. I put about an oz or two of the syrup in a 24 oz bottle and it was pretty darn good. You can adapt this to any fresh or dried herb and strain before bottling. Thanks for your site – good tips! Gary – thanks for sharing. I bet that would give nice flavor without chunks. Would you please say when you put your extras in? Is it right before you put it on the counter for a day or two. I am a newbie. Thank you! Yes, I add the "extras" in when I bottle a batch that has finished the initial brewing. HI to all. I just found your site and it's such a pleasure to learn from all of you. I just made my first batch of Kumbucha. It brewed for 10 days and then I bottled it with lots of berries and a small stick of cinnimon. After frementing for about 24 hours I tasted it. It tasted like strong apple cider vinegar with fruit…too strong. Is that how tart vinegary it's supposed to be? How do you make it sweeter like almost what is bought in the store? I have water kefir and it carbonates well and tasts mild with the same fruit. Jeannine – You may have brewed it too long at too warm temps. It should be brewed at least seven days, but if your home is warm the fermentation will proceed more quickly. Once I bottle mine, I typically only leave it at room temp for 24 hours before chilling. Try a shorter fermentation to sweeten your brew. As it ages, the microbes eat more of the sugar, and it tastes more like vinegar. On Feb 21, 2010 you mentioned kefir soda and kefir raspberry lemonade. How do you make these? I am new to making both kombucha and kefir. I don't quite have the knack with the kefir yet – it keeps separating and being thin instead of thick and creamy. But the kombucha has been great. So far I've only used fruit juices (black cherry, grape, and cranberry) and then also pieces of ginger which is my favorite so far. I can't wait to try some of the suggestions I read here. With the milk kefir, warmer temps and longer ferments give a thicker product for me. I always use whole milk. When I use non-homogenized milk, sometimes I get a thinner product, or the cream will culture at the top leaving a thinner base below. I try to stir it every few hours while it's culturing. I flavor my kombucha by adding a tea bag to the jar after removing the scoby (and starter amount for next batch of course). I have tried raspberry and tropical herbal tea as well as some vanilla chai and peach. I leave it for about a day and then bottle my flavored kombucha. One tea bag does a nice job of flavoring. I like Celestial Seasonings variety. To the anonymous poster above, when you take your grains out of your milk kefir you will want to blend it (alone or with some fruit for a smoothie) to combine the curds and whey that is formed as part of the kefiring process. Thanks for the tips, starfreedom. Hi Laurie! I have really enjoyed reading all the above info!! I am on my 4th brew of Kombucha so am a relative newbie to this. I have been using Earl Grey tea bags so far to brew with and 1/4 cup of white caster sugar added to 1 litre of water. What other tea bags can I use? Also can I use honey or maple syrup instead of sugar? If so, how much honey or maple can I use? I just went and added some small slices of fresh ginger to a batch I refridgerated yesterday! Next time I will add it to a fresh brew and leave on the counter for a day! Danielle – hold up! Don't use Earl Grey tea bags! They contain bergamot, which can harm your kombucha culture. Do not use any teas that contain essential oils, as many of these have anti-bacterial properties. Honey is not recommended, as the naturally occurring bacteria in honey can also harm your culture. Maple syrup is not recommended, either. 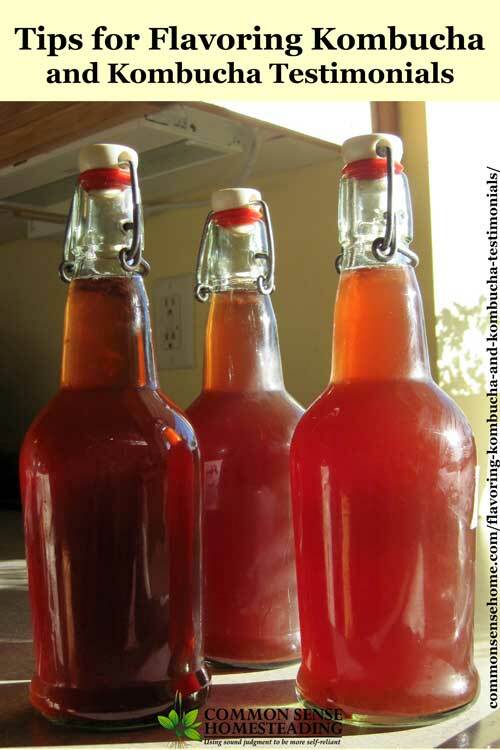 Kombucha grows best on straight glucose, which is best provided by plain sugar. I've been hooked on the K drink for a few months now, and it's pretty sad when I leave my bottle at home. My day is just not the same. I do have a great combo flavor that I absolutely LOVE. Mango and chili peppers with ginger. If you don't like spicy drinks then don't use the chili peppers. Receipe: half a mango – depending on size – if it's small I use the whole thing. Try it! I hope you like it. I have a batch of kombucha ready for bottling but I'm scared to death of exploding glass. I only want to use glass though. Is the "burping" method sufficient enough to keep the explosion potential to a minimum? Thank you! I've been doing this for a few years now and have yet to shatter any glass. Once you bottle them, you have several options to minimize risks. You can immediately store them in a cool location, which will slow down fermentation, thus reducing possible gas build up. You can burp the bottles regularly (every day or two), to make sure pressure doesn't build up too much. You can seal the bottles loosely with a screw on lid, so they release pressure on their own. As you work with your brew, you'll get a feeling of how quickly pressure builds in your conditions with your culture. This are living organisms, so each one is unique and they respond to their environment. I have been brewing for many years, selling for a couple years. I’m not sure if anyone can answer this question but a chemist who has analyzed the brew, but here it is: If essential oils in flavored teas can damage the scoby in the brewing process, then could they not damage the culture, which is one and the same, when added for flavoring in the bottles? My concern is my ginger-lemon flavor, which everyone LOVES, I use fresh chunks of ginger root and CPTG lemon essential oil. But I have always had a thought in the back of my mind, herbs affect the culture, I’m not sure this is still the potent stuff I brewed… And yes I am using a straight essential oil, but some of these other flavoring ingredients mentioned contain essential oils… is there any information on analysis of flavored kombucha? I am searching the net and can’t find anything, but I think I’m going to suspend my ginger-lemon sales until I can get more info. Thoughts? Suzanne – I haven’t seen anything definitive on this, but it would seem logical to me that essential oils and other ingredients with strong anti-bacterial properties would indeed affect the live cultures in the drink. If you want to use these ingredients, I would probably limit the amount used and recommend that they be consumed in a relatively short amount of time to preserve the maximum amount of beneficial bacteria, etc. If you added it with the scoby and brewed for 1-2 weeks (or more), it would seem that this would be much more detrimental to the cultures than being in the drink for a few days only. Thanks for the prompt reply! I think I am going to stick with plain until I can get some more solid information. I will let you know what I find. Thanks for the great blog! Well so far, I found that strawberries and peaches do not contain an essential oil, two fresh fruit flavors that are favorites in my little village. Yes I add these when I bottle, not during the fermentation. I just read that brewing with flavor ingredients, which you just warned me against, can actually grow some pretty detrimental bacteria. Also I found that cranberries and coconuts do not have an essential oil. I am still curious about how the other constituents affect the brew, however my fruit brews still taste very KOMUCHA-like, while the ginger-lemon just doesn’t seem to keep that same flavor. Suzanne – that makes sense with what I’ve seen, too. I’ve never flavored with essential oils, and I rarely use ginger. I know a general rule of thumb is that if any of your ferments taste of smell “off”, it’s better to error on the side of caution. Laurie, I really appreciate your feedback on this, and your title Common Sense Woman. 🙂 My feeling about what happens with the ginger & essential oils is not that the kombucha becomes detrimental, but just becomes a ginger-lemon soda with those virtues, rather than much of the kombucha virtue – so I think I’ll just start making some ginger ale or beer separately from my kombucha operation. Still going to be on the lookout for a chemical analysis. Also, this is probably really obvious, but I am just confirming my non-sourced knowledge, most fruits do not contain an essential oil (besides citrus), or they would be available on the essential oil market. So, none in blueberry or blackberry, more favorite kombucha flavors around here. Also I thought I’d speak to the exploding glass issue because it HAS happened to me, years ago when I decided to see just how long I could age fruit kombucha, to see just how fizzy I could get it. Well, luckily the gallon jugs with fresh strawberries that exploded were in a cabinet, and so somewhat contained, but they were like bombs exploding. Now I am ALWAYS checking pressure on every bottle no matter what, and have learned that even though a whole lot of carbonation tastes better, it is dangerous. It has never happened again and I do get my kombucha pretty fizzy still. That did happen on the “Ides of March”. I am not superstitious but I found it an interesting coincidence that I was out having dinner with family and we were discussing this “bad luck” day at the time of the explosions. Kombucha seems to yield endless interesting and unusual stories…. Thanks for all the great information. A year ago I bought the ‘set’. Milk kefir (never could stomach it although it fermented wonderfully for me), water kefir which I love and kombucha. The problem is I live in a warm environment and I have product “flowing”. I just cannot drink enough of it to keep up! I feel it is such a waste to throw my excess away and friends and family are fully stocked. I contacted local health shops and want to start supplying to them but was hoping for some flavoring and bottling advice. Another supplier supplies the health shops nationally in plastic bottles. I realize this is not first choice but from a transport and practical perspective this does make sense. I don’t want to make a fortune out of the kombucha, I just want to cover my costs, keep the scobys healthy and well fed and bring down the current excessive prices of this wonder drink, make it more available/accessible so to speak. Any advice would be most welcome. Thanking you in advance. You might want to contact Hannah Crum of Kombucha Kamp. I bet she’d have some ideas of how to move forward. Thanks Laurie. I’ve sent Hannah an email, just awaiting a reply. The flavored Kombucha bottles is a great picture. I’m wondering if you have a high resolution image that you would give me permission to use in our upcoming Kombucha feature. I typically use a herbal tea bag to flavor mine. It means flavoring in a different container, since you can’t get the tea bag back out of a long neck bottle, but it is worth it! The peach tea bag makes my K-T taste like peach juice! But my favorite is honey chamomile – super nice, mellow taste. I had been very ill and bedridden for a year before learning about nutritional healing. But even after healing enough to function day-to-day, I was still in chronic pain for eight years. And then I started brewing kombucha. Within TWO WEEKS, the pain was completely gone! Since then, I’ve been able to complete a marathon, several half marathons, a sprint triathlon, a Ragnar Relay and several other 5k to 20k races. Don’t get me wrong – I’m as slow as molasses! But I’m proud to be able to finish these events when, at one point, I thought I’d be in a wheelchair the rest of my life. That’s wonderful that you have found healing through nutrition. Thank you so much for sharing your story. I love all your info. I work at an all vegan/organic co-op and had my first taste of ‘bucha tea there. I have since successfully brewed my own tea with great results. I was wondering if I could use organic flavorings – the kind that are extracts either mixed with alchohol or glycerin – to flavor my tea in the 2nd fermentation using only a few drops, of course). I now use crushed organic ginger (crushed in a garlic press) but I need something more convenient. I also use frozen blueberries, but are the berries become discolored so I don’t know if that is good or not! So far no ill effects from drinkink it, no bad smells either! I love the giardelli chocolate idea…I use it in my greek yogurt now with ground almond and flax “flour”. I like to experiment, as you can see! Thanks for any input you can give me! I can’t see any reason not to use the flavors when you bottle, unless they have anti-bacterial properties (which would be my concern with using some essential oils). I use frozen blueberries all the time. I just wanted to add that I have heard of brewing the tea (without the kombucha yet) with some chopped up ginger and then adding it to your kombucha with the scoby or starter for brewing. I tried that (after straining out ginger pieces) and noted that the new scoby formed much slower than the ones without the ginger. I added more straight tea and suger and it seemed to pick up production. (Maybe not enough sugar the first time? and also it was when temps outside started to drop). I would be interested in hearing from others with this kind of experience. I did just read the posts about adding essential oils to flavor a final brew. Maybe add them right before consuming is best. I don’t know enough yet to say…still so new to brewing. My son is at univ. of wisconsin at madison and is using kombucha scoby in different experiments. He knows quite a bit about this fungus (which is mostly made up of cellulose! ) I need to ask him more about it! He has pictures of it using a very high power microscope. Very very interesting! Given that the scoby is a “symbiotic colony of bacteria and yeasts”, and ginger is naturally antibacterial, I’d be hesitant to use ginger in the initial brewing stage out of concern for damaging the colony. I tried to make blueberry flavored kombucha. Added the blueberries in the bottle for the 2nd fermentation and by drinking time, the blueberries appeared mucky like something you would see at the bottom of pond. Is that normal? I of course wasn’t sure so I didn’t drink it and have given up on Kombucha for a while. My scoby has since been sitting above my cabinet for about 5 months now. Probably would have to start over with another if I can figure out what went wrong with the blueberries. lol – yes, the cultures will start munching on the natural sugars in the blueberries and give them a cloudy, filmy appearance. Perfectly normal. If too creepy looking, try organic blueberry juice. I watch for sales in the natural foods section of our local grocery store and often pick up a bottle of whatever organic juice is on sale. You can also use homemade juice from your juicer. Whatever is most appealing to you. Did you ever figure out an appropriate amount of ginger for your brew? I like Reed’s ginger brew, and it kind of burns going down my throat, personally. What is your preferred level of gingerism? Burn or no burn? I stopped experimenting with ginger since I’m just not much of a ginger person. No burn would be preferable for me. hi kombucha was introduced to me by a friend and was taught how to make. she gave me the scoby for a start it was fantastic. its only four times that have made a blew and what i say is yes i worked for me. i have been having constipation problem for year but before i could make my blew she gave on hers to taste it was like getting a miracle for my stomach because i feel a great improvement. even me now ican be able to vist the other private place normally an feel appetite to refil the stomach again. why should i say it does not work if i had gone for a scan 3 times and there was nothing doctors would say. I believe I had digestion problems. Before drinking Kombucha, I was farting a lot… big, noisy ones.. embarrassing, disgusting… After drinking Kombucha for a little over 3 months, I seldom pass gaz. I also had hemorrhoids. Now gone. My hair was thinning. I have a lot less hair on my brush now. I also feel more energetic. My thoughts are clearer. Thank you for sharing your experience, Sylvie. You are welcome. I forgot to say I had those benefits from home made kombucha flavored with ginger and lemon. I also have a friend who I started on it. He says he feels better since he started drinking Kombucha.. He is making his own now. My friend is an alcoholic. Not even 2 months after starting Kombucha, he stopped drinking. He told me he had drank enough… Amazing… I had read it could happened but wasn’t sure it was true. It is. He also has psoriasis. It is not gone completely, but he says it helps. He showed me one place where he has it. It looks so much better. Woaw! I have noticed two very important health improvements since drinking Kombucha. I was diagnosed with GURD and Chronic Constipation over 15 years ago. I was on medication that is known to cause bone damage if used over an 8 week period (Studies have proved that taking Omeprazole for over an 8 week period can cause bone degeneration), and laxatives to stay regular. I am happy to say that adding Kombucha to my diet has allowed me to discard both medications from my cabinet. I have now started making my own. 7/4/17 I drank my first home made mango ginger lemonade. A bit to much ginger and lemon but still drinkable. Looking forward to tasting the other flavors I made with the first batch ( Blueberry lemonade) and adjusting my next batch. The first batch I let brew for 15 days before I added the fruit, this batch will have brewed for 8 days and am excited for my second attempt. Thanks for sharing your experience, and glad you were able to improve your situation. Thanks for sharing your thoughts, ideas and tests here. I did kombucha in the 80s so I’m on my 2nd time around. Thought Colada would be a great to try but didn’t see the quantity of kombucha you used to start adding coconut water, extract and pineapple juice to. Thanks for your help! Sorry for any misunderstanding. I generally start with a quart mason jar or bail top bottle, add flavoring, and then fill the container.